I originally worked in the fields of Painting , Pottery and Serigraphy , I then moved into creating jewellery with his brother Leigh , designing and manufacturing all their own unique pieces . 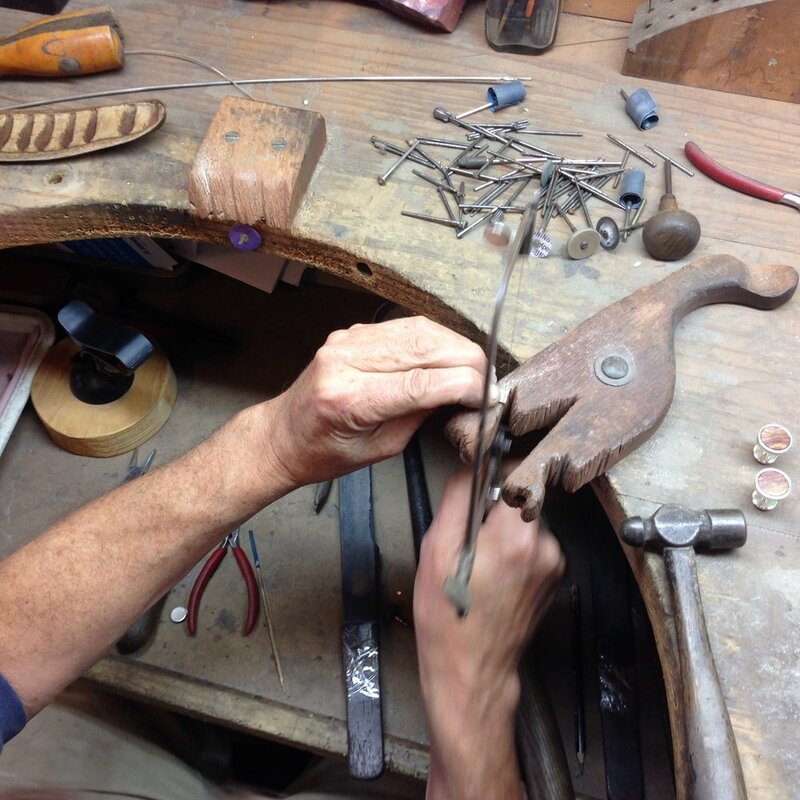 All the jewellery I produces is created in his workshop my Fremantle using only the purest gold and silver , which I alloy myself . Below is a selection of Government and Business Commissions I have done over the years. Cufflinks presented to His Royal Highness Prince Philip on his 90th Birthday . Gold Cufflinks for Rio Tinto presented to the Chinese President Hu Jintao . Pendants to be presented to the USA President Obamas daughters . The Coat of Arms of Australia , Cufflinks and Lapel Pins for the Prime Minister of Australia’s Department . Man of the Match Award for the Prime Ministers XI Cricket Match 2014 , 2015 and 2017 . Cufflinks for the Governor-General Her Excellency Ms Quentin Bryce AC . Cufflinks for the Foreign Affairs Minister Stephen Smith . Cufflinks for the Australian Ambassador to the United States Kim Beazley . Cufflinks of The Coat of Arms of Western Australia for the Western Australian Premiers Department . Cufflinks , Pendants , Brooches and Letter Openers for the Western Australian Premiers Department . Cufflinks of the WA Parliament House Crest for the Western Australian Parliament House . Swan Kangaroo and Koala Cufflinks for the Perth Mint . Cuff Links for Mining Company Rio Tinto for corporate functions . Cufflinks presented to the Head of Mitsubishi in Japan . Cufflinks presented to the Head of Nippon Steel in Japan . Sea Lions and Penguins for Taronga Zoo . A badge honoring Dr Jane Goodall for Adelaide Zoo . A series of Panda designs , exclusively for Adelaide Zoo . A Cheetah for Canberra’s National Zoo and Aquarium . Seahorses , Leafy Sea Dragons for AQWA ( Aquarium of WA ) . A variety of flora and fauna for the Rottnest Island Authority . Bicycles for the Rottnest Island Authority . Badges for the University of Notre Dame . Kangaroos , Koalas , Monkey , Zebras , Leopards , and Giraffes for Melbourne Zoo . A Platypus for Healesville Sanctuary . Seals for Underwater World Mooloolaba . Blue Wrens for the Denmark Visitors Centre .